Bike U-locks (sometimes called D-locks or buckle locks) pretty much look the way they sound, that is if you were picturing a lock that looks somewhat similar to the letter ‘U’ or the letter ‘D’, depending on how you look at it. A bike U-lock looks very similar to a padlock, and it is likely that they share a similar history. As far as parts and specs go, a bike U-lock is, generally, fairly simple. Most bike U-locks consist of a shackle, a crossbar, and a spline. The shackle is often the most easily identifiable part of the lock, and it is the section that gives a bike U-lock its ‘U’ shape. I guess you could also say it is the inspiration for the name U-lock. 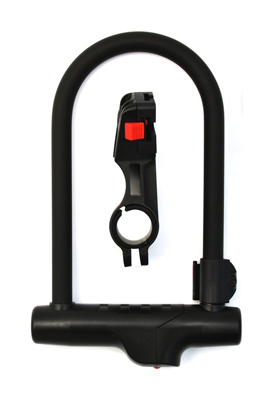 The crossbar is the part of the U-lock that houses the lock cylinder, and it also the where the shackle is housed and secured. 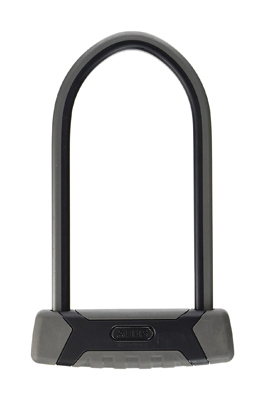 The nature and durability of the lock cylinders featured in bike U-locks vary. However, the two components (the shackle and the crossbar) mentioned above are pretty much mainstays on most of the bike U-locks that you will come across, except for the TiGr mini bike lock, but we’ll get into that later. I will start by pointing out the fact that the Cocoweb Heavy Duty Bike Lock is not the most secure bike lock on the market, especially in comparison to some of the other locks that you will see on this list. However, it is an extremely cost-effective option and it is best suited for people who want to keep their bikes secure in areas that have minimal to low crime rates. This is why it is still a bike lock that prioritizes security, even though it is meant for low crime areas. It always helps to be prepared, but if you are in a low crime area, you can most likely afford to get the Cocoweb heavy duty bike lock without having to worry about any long term consequences like losing your bike. When using this lock, you will probably have to practice other vigilant methods of security to ensure that you are not leaving your bike security up to chance. Pairing this lock with one of the best padlocks and a security chain really push it over the top. The Cocoweb lock features a 14mm solid steel shackle design and an additional 2mm wrapping of PVC material. As you continue to read further on, you might make the assumption that this lock sounds better than I made it seem. The thickness of the shackle sounds optimal, but the material of the lock and the construction of the locking cylinder are the areas in which this lock sometimes falls flat. However, like I said, if you are looking for a bike lock that offers good security in a low crime area, and doesn’t break your budget then the Cocoweb heavy duty bike lock is for you. Seeing a Kryptonite lock featured on this list should not come as a surprise. 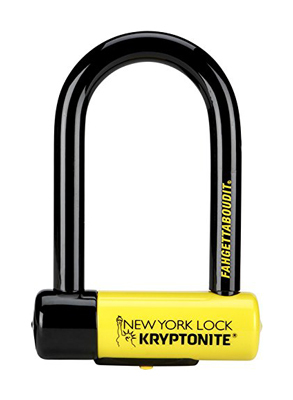 After all, Kryptonite is one of the leading pioneers of bike U-locks and padlocks. Although their designs are similar, each Kryptonite lock brings its own flair and sense of individuality to the table. The Kryptolok Series 2 lock is nowhere near as secure the Kryptonite New York Mini (which, we’ll talk about later), but it still deserves a spot on this list. The Kryptolok series 2 standard lock features a 13mm hardened steel shackle which is impervious to cutting and leverage attacks. By kryptonites own standards, the lock was given a security rating of 6/10, which makes it a secure lock, but not one that is suited for high-crime areas. However, don’t take this as a knock on the locks performance. The lock also features a high-security disc cylinder that makes it difficult for burglars to bypass. Another feature that makes this lock stand out is the fact that the crossbar is reinforced to prevent tampering. The other bike locks that we have discussed up until this point focused mostly on the security of the shackle, whereas Kryptonite has spread the security around. The lock itself weighs in at just under 3 pounds, and has a length of roughly 22cm tall. The Blackburn San Quentin U-lock is another great locking option that cyclists can take advantage, and it is also a bit easier on your pockets than some other locks. This lock has a high security rating and is meant to guard bikes in even the most crime riddled areas. With an 18mm steel alloy shackle that comes paired with its unique twist proof hexagonal shape, the San Quentin lock truly gives burglars a tough time. Do not think that because of its position it is not secure, there just happens to be some other locks that have a higher security rating. Furthermore, the lock features a dual bolt locking mechanism that keeps both sides of the shackle secure. Also, the locking mechanism is able to withstand picking and bumping attacks. These features alone make it a much sought after bike U-lock. However, in addition to this, the lock boasts a 16 ton cut resistance. Don’t make the mistake of thinking that I am embellishing this lock, it’s a good option for its price point, although some of the ones below are better suited for higher security. The Blackburn bike U-lock also includes a $4000 theft replacement guarantee with the purchase of this lock. 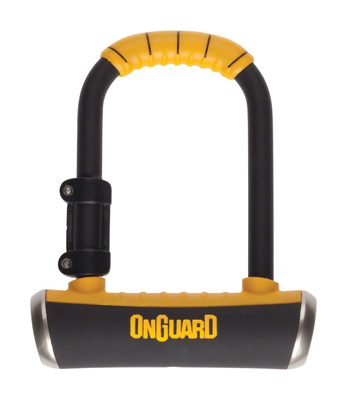 OnGuard is one of the most popular manufacturers of bike locks, and they have helped a great deal of cyclists secure their investments. Some cyclists will already be familiar with the ‘big brother’ to the OnGuard Brute Mini; the OnGuard Brute Standard. However, as far as security and ease of use goes, the mini is a much better solution. The mini has shackle dimension of 16.8mm. The mini itself is just under 6 inches long, which makes it a relatively compact lock. With minimal space, burglars will have less room to work bolt cutters onto the shackle. This is the main reason why the OnGuard mini is lauded for its security. In addition to this, the lock has a gold sold secure rating and an OnGuard security rating of 97, which makes it one of their most secure locks. Furthermore, in comparison to the standard version of the lock, the Brute mini excels at security by providing a quadruple locking mechanism. This locking mechanism makes it nearly impossible for criminals to even attempt to pick the lock or to bump it in an attempt to bypass it. The size of the mini also makes it much easier for cyclists to carry the lock around. Do not underestimate the role ease of access and comfort can play in security. Abus is somewhat of a security household name when it comes to bike locks and padlocks and they are trusted by many users worldwide. The Abus GRANIT X-Plus 540 bike U-lock is another lock that is firmly holding up this tradition. 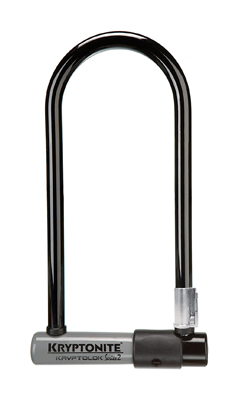 The X-Plus bike lock comes with a 13mm wide hardened steel shackle that provides users top-notch security. That shackle is also being paired with a lock cylinder that offers the highest protection against manipulation attack like lock picking. The locking cylinder itself is also made of special hardened steel, which means that the cylinder itself cannot easily be exploited. This lock is also backed by the ABUS patented power cell technology which makes the lock pretty much impervious to physical attacks like hitting and pulling attacks. The length of the shackle extends 9 inches from the crossbar, which gives cyclists ample amount of space to work with. It is always best to leave as little space as possible so the shackle cannot be manipulated, but with a lock like this burglars don’t stand a chance. As far as bike U-locks go, this lock probably has the most pizzazz. I mean, read its name out loud again, how can you not be impressed by that? It is probably the only lock you will ever come across that is so distinctly ‘New York’. The Kryptonite Fahgettaboudit mini lock offers a clinic in bicycle security, and it is also backed by the security expertise, and brand power, of Kryptonite. The lock itself has a Kryptonite 10/10 security rating (as compared to the Kryptolok’s 6/10 security rating) and comes with an anti-theft protection offer that lets buyers know that the product is backed by more than just your average customer service. The lock consists of an 18mm hardened steel shackle that can be considered the apex of bike U-lock security. The shackle is fitted into a crossbar that has double deadbolt that is paired with a high security disc cylinder. The New York mini also has a protective vinyl coating to make it even more resistant and tamper proof. The crossbar is further protected by a hardened steel sleeve that makes it nearly impenetrable. Admittedly, the lock is a bit heavier than most of the locks on this list (weighing in at 4.55 pounds), which makes it somewhat of a burden on some cyclists. However, for those who prioritize security far over comfort, this lock is one of the best options. 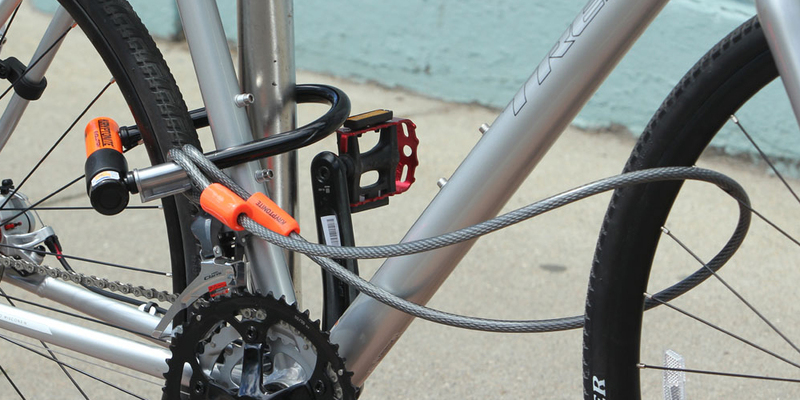 The TiGr mini is somewhat of a non-traditional bike U-lock. Unlike most other U-locks, the TiGr mini is a bit more liberal with its design. 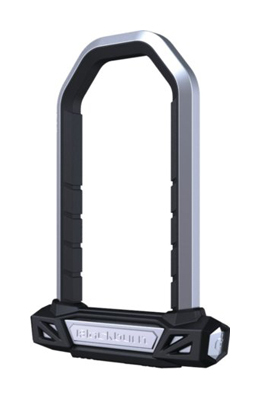 The overall mechanism of the bike lock itself consists of a locking cylinder and a titanium metal bar. The titanium metal bar can wrap around a section of your bike to effectively keep it locked firmly in place. 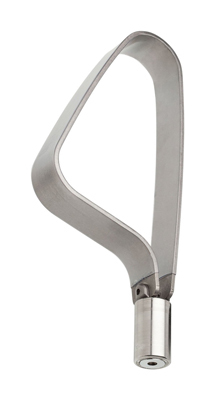 The titanium metal bar also acts as the shackle while the lock cylinder is, essentially, an oddly shaped crossbar. The design of the TiGr mini is rather sleek and seems to lend itself more towards minimalism than anything else. Although this lock favors minimalism, and is rather smaller and lighter than most other locks, it does not skim on security or accessibility. These elements are still at the forefront of the locks design. The TiGr mini itself weighs in at 0.9 pounds, which makes it lighter than any of the other locks that are included in this list. It also makes it one of the best bike U-locks because users won’t have to worry about lugging around a lot of weight. The lock features a push button lock that makes it easy to close lock up your bike in a hassle free manner. The titanium band has a width of 1.25 inches and this a key factor in its resistance against cutting attacks. However, we all know that given enough time all locks can be overcome, so even though this lock is relatively secure, its purpose is meant to deter burglars enough to the point where they give up. It is at this point that additional security measures should ideally kick in. How do you know which bike locks prioritize security? Identifying the best bike U-locks that prioritize security is no easy task, and choosing the wrong lock can be very costly. The worst case scenario involves you chasing after some bike thieves with nothing but your bike tire left to hold on to. Bike thieves are extremely relentless and crafty, so you have to choose a lock that is resilient and durable. As most of you already know, all locks can be picked or bypassed, given enough time. So the goal here is to choose a lock that makes it nearly impossible for a regular criminal walking down the street to steal your bicycle. Ideally, you need to pay close attention to the size of the bike lock. This is important because you always want to make sure that your lock can effectively wrap around a section of your bike, without leaving too much space for burglars to exploit. Most people confuse the general size of the bike U-lock with the size of the shackle and though this is understandable, it is incorrect. The size of bike U-lock refers to the space that is within the ‘U’ shape of the shackle, and not the thickness of the shackle itself. Like I said, choosing a lock that doesn’t afford burglars and criminals too much space is best. This does not necessarily mean you have to choose a small U-lock, instead choose one that is proportional in size to your bicycle (and sometimes it just might be a small U-lock). The thickness of the shackle is usually telling of how secure the lock will be. To determine the thickness of the shackle, the diameter is usually measured, and just in case you forgot, the shackle is the part of the lock that gives rise to the name bike U-lock. However, do not be deceived into thinking that every shackle with a wide diameter automatically means it is a secure bike lock. The thickness of the shackle goes hand in hand with the material that was used to construct it. If a weaker material was used, then the thickness does not really matter, as it will still not hold up to cutting attacks from bolt cutters or angle grinders. There are some U-locks that have thicker shackles to really elevate their security. The material of the shackle and the overall lock itself are directly tied in with the longevity of the lock and the level of security it provides. A bike lock made from titanium or from a hardened steel alloy provides an ample amount of security that even the most seasoned burglar would have a tough time getting around. Cheaper metals might usually mean a much cheaper bike lock, but you need to understand that cost is not always monetary. Skimping on security to save a few dollars can cost you much more down the line, probably an entire bicycle. Try not to focus too much on the price point of the lock, instead think more about the long-term security benefits that it might pose. Now, let’s take a look at some of these locks.